As established already*, Liang Oscillation is the behaviour exhibited by the continuum of spacetime when altered. The quantum states of particles are defined by the 5th ‘meta dimension’, which is best thought of as the path of spacetime. When a Chrononaut alters past events (or visits them), they enact a change on the shape that spacetime occupies in the meta dimension. Plotting a space-time graph, we can imagine the history of a complex system to be represented as a line. From an abserver looking at this history the system’s history is fixed. To the present, the past is a straight line and the future is non existant. Now, if we make a small change to the system at a point some time ago, spacetime will ‘veer off’, as a sequence of chaos amplifies to make a very immediate change. This ‘butterfly effect’ was predicted by Chaos Theory as early as 2.0.C. However, unknown at the time, a curious property of the meta dimension is that the path of quantum probability has an ‘optimum’, almost like a river settling into a valley. This leads a change in the system to eventually reverse and invert repeatedly, our ‘line’ of spacetime waving up and down until the deviances slowly converge and the system’s distant future is largely unchanged from how it was originally; hence the ‘occillation’ Dr Liang postulated in 2.9.C. The history of time travel as a serious science is surprisingly sparse, up until the mid to late third millenium. By 2.9.C * it was growing fast, as new ways to transmit information along time were continually being discovered. However, there was a crucial limitation that prevented movement of a person against time’s flow. The Law of Conservation of Energy states one of the cornerstones of known science: energy (and therefore mass) cannot be created or destroyed, only transferred. Because of this, the sum of matter and energy in the universe at any given moment will always be the same. In other words any object, such as a chrononaut, cannot physically move back in time (as any given quantum particle only exists once at any point in time). On the other hand, information is an abstract construct and thus circumvents the mass-energy constant. Thus, a breakthrough came with the invention of Teleportation. This controversial new technology destructed mass at one location, then remotely assembled the pattern using atoms elsewhere. The implications were many: revolutionising transport, causing a multitude of religious wars (due to its shattering effects on the Self and supernatural concepts) and opening up the economy of the solar system. It was only a matter of time before the method was applied to Tetra-warp, the method of shifting atoms in the past. With this advancement, true Chronoportology was born. The other great limitation to the practice (that remains unresolved), is the necessity of a highly accurate set of data about the target location and a heap of matter to manipulate. This target window and assorted matter is known as a Chronozone. 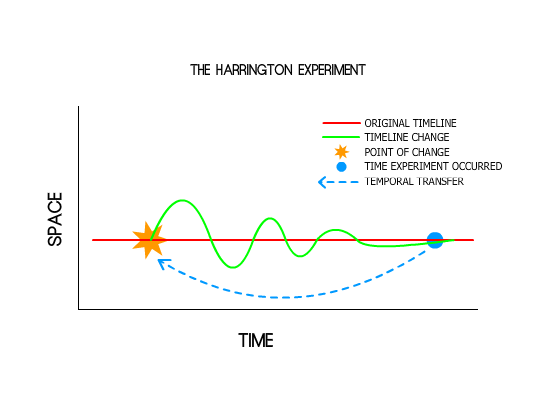 Given that their creation and recording depends on prior knowledge of Chronoportology, destinations before the invention of time travel would appear impossible. This also explains why no time travelling has been witnessed in past records. (*) – The Novodantis Core uses thirty-second century notation for centuries: eg. “2.9.C” = the twenty-ninth century. The Liang Oscillation Effect (often referred to simply as “Liang Oscillation”) is the effect observed primarily by chrononauts; that is, people that have moved through the spacetime continuum in a non-natural manner. Named after Dr Liang Shi Meng (梁时萌) in 2982, it is a theory describing the behaviour of altered time. Contrary to early concepts, changing past events doesn’t produce an alternate parallel timeline. Nor does that timeline skew off at a tangent, forever getting more and more different from the original events of history. Time, if modeled as a crude line on a graph, in fact oscillates like a wave when it is changed. This is based on the concept that the effect of an event will be proportional in significance to its cause, the majority of the time. In other words, big changes will come from big things, typically. Sometimes we observe what we call the Butterfly Effect, when something very small sets off a chain of implications that snowball up into a massive effect. But the probability of one of these occurring is inversely proportionate to the difference in significance. Ergo, a butterfly and hurricane are a factor difference of several billion and as such a given wing-beat has a one to a billion probability of being necessary for the hurricane formation. This is only measurable however with identical circumstances in the same time and space, requiring information to travel through time in order to produce precise results.